This particular BOLO (Be On the Lookout) flyer is very important. "Here is the public BOLO …[that has previously been sent out in a press release]. 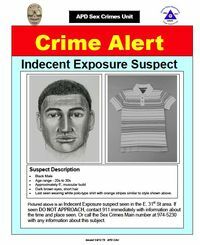 on an indecent exposure that occurred on Christmas Day, Dec 25th, in the same area [as the New Years Eve Attack) . I hope this BOLO is seen everywhere and passed around all the neighborhood sites that we can get it to. 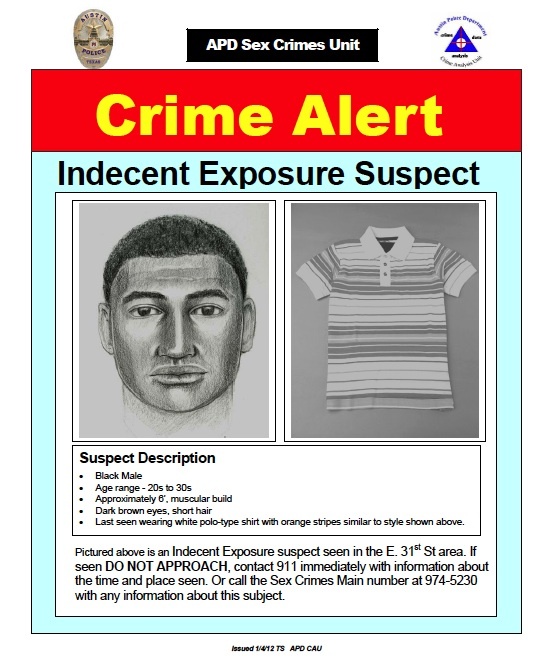 It includes a specific description of the exposure suspects shirt worn on Christmas day. Someone out there knows this guy and we need to get to that person. This is a case that the public will absolutely be needed to help us solve it. I think if someone knows this guy, they need to see this bolo with THIS SPECIFIC INFORMATION. Thanks for any help can give in getting this out, I hope to see it EVERYWHERE. Thanks very much for the help!!!!" The file is a version that can be distributed if an area canvas is being done. Or left with apartment complex managers etc. We thank APD for working diligently on TWO homicides back to back and all the other crime that has occurred recently. A special thanks to the Senior Crime Analyst and Forensic Artist who put this together. Neighbors, please utilize your resources in your neighborhoods, no matter what part of Austin you live in, to get this flyer out because this guy could live, work, attend classes or hang out anywhere. As he said, somebody out there knows this guy and needs to see the BOLO poster. Thanks to everyone who can help out with this. Let us know about your efforts so we know this is being circulated.